This weekend, iRacing.com hosts its annual virtual Bathurst 12 Hour race using their iRacing Online racing platform. The Bathurst 12 Hour is a 12-hour endurance race staged on the Mount Panorama Circuit in Bathurst, New South Wales, Australia. This event serves as the opening round to the Intercontinental GT Challenge Series in the real world. The virtual version of this race is held on February 9-10, 2019 and has sim racing teams compete in the race driving the iRacing Audi R8 GT3 LMS, Mercedes AMG GT3, Ferrari 488 GT3, BMW Z4 GT3, McLaren MP4-12C GT3, and Porsche 911 GT3 Cup. As every year, we will see many avid sim racers and a selection of real-world racing drivers compete for the win at the virtual Mount Panorama. Team Redline, who are arguably the worlds best know sim racing team have now announced their eight-driver squad line-up for the 2019 iRacing Bathurst 12h race, and it is an interesting list, to say the least. 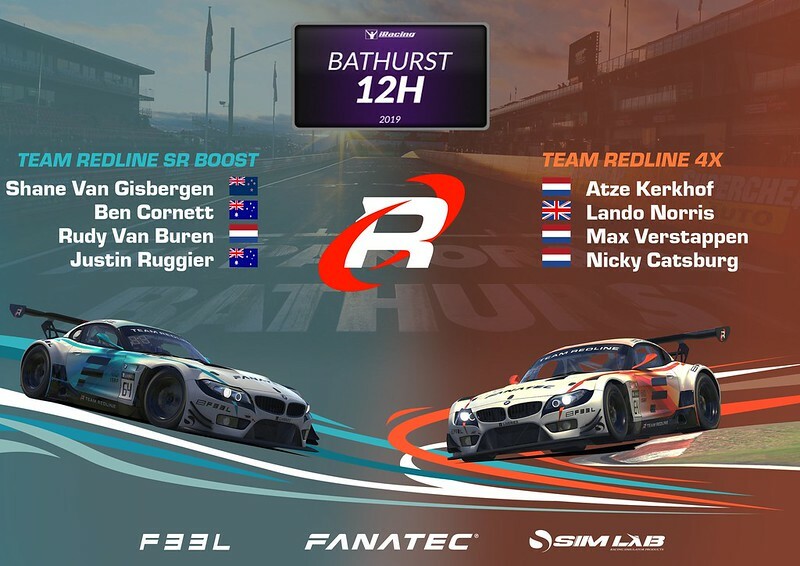 Team Redline boss and owner of the Adrenaline Control Sim Training and Driver Coaching service, Atze Kerkhof will team up with Formula One driver’s Max Verstappen and Lando Norris, and with BMW factory driver Nicky Catsburg who took part in last weekend’s real-world 2019 Bathurst 12H with the Walkenhorst Motorsport BMW M6 GT3. The four gentlemen will man the virtual Team Redline 4X BMW Z4 GT3. The second entree for Team Redline is forming the Redline SR Boost Team with former Bathurst 12 Hour winner and V8 Supercars champion Shane Van Gisbergen, McLaren simulator driver Rudy van Buren, Kumho Tyres V8 Touring Car Series driver Justin Ruggier and Team Redline’s Ben Cornett. The iRacing 2019 Bathurst 12H event will be broadcast LIVE to the public at iRacing.com/live, with coverage powered by RaceSpotTV.